As a project manager, I often need a clean, professional way of showing a client what a project looks like via a Gantt chart or timeline, usually in a PowerPoint presentation. Often times, the information needs to be high level, too – so there’s nothing wrong with having a separate tool just for presenting this information. Sometimes you just want to impress your clients with more than technical knowledge, right? I believe presentations should be useful and shiny. TL;DR: I really like Office Timeline, which gives quite a few good options even just with the free version. I have chosen to go with the paid version with a yearly cost of $50 – I think it’s completely worth it for how much it simplifies my project management tasks. Note #1: I have not received any kind of compensation: my opinions are completely my own. Note #2: The rating does not reflect the product as a whole but simply as a solution for high level planning and customer presentations. I did look into a few online alternatives such as Smartsheet Online Gantt Chart, Team Gantt and Tom’s Planner. Tom’s Planner made it the furthest, but none of them were actually used in the final draft of a presentation towards a client. These were oriented more at long term project/resource planning and not the kind of presentation I was looking for. PowerPoint’s drawing tools, in combination with a table, can be a valid solution for maintaining a global project plan. As a junior project manager, this is the most common approach I had seen – and I realized that I absolutely hated it when a project plan needed to be updated. This is quick to set-up and the drawing tools help set alignment / distance to keep it neat. 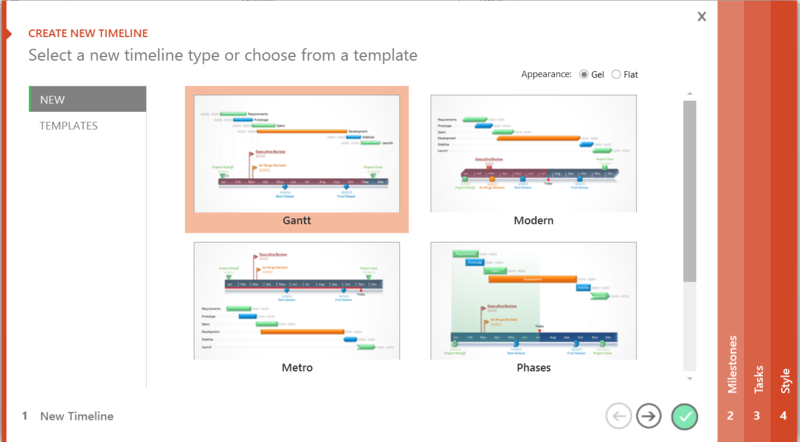 It also is easy to match to your PowerPoint theme as you can simply select the colors. If you’re already in PowerPoint for a presentation, why not just use PowerPoint for the chart, too? However – it is not a very granular solution and it is difficult to show details. It’s also difficult and time-consuming to update when the project changes. I find it difficult to make this look truly professional. Bottom line: It works. It’s a good quick and dirty solution, but it’s difficult to maintain and not really polished. Excel is a pretty good project planning tool. It really shines when you want to do calculations in your planning, i.e. with hours per task, per resource, per week, etc. This works great as a detailed planning! It’s a wonderful tool to have as a project manager during a project. However, it is not shiny enough to put into a presentation to a steering group. I could certainly dress this up some more by removing the grid lines, adding labels to the arrows and star, etc. However, If I wanted to center the phase labels, I would need to merge the cells together. Even now, it would be frustrating to go back and adjust this planning when something changes – if I needed to un-merge cells as well, it would become a nightmare. Bottom line: it allows for more detail than PowerPoint, but really doesn’t look very nice. It’s also very difficult to update. 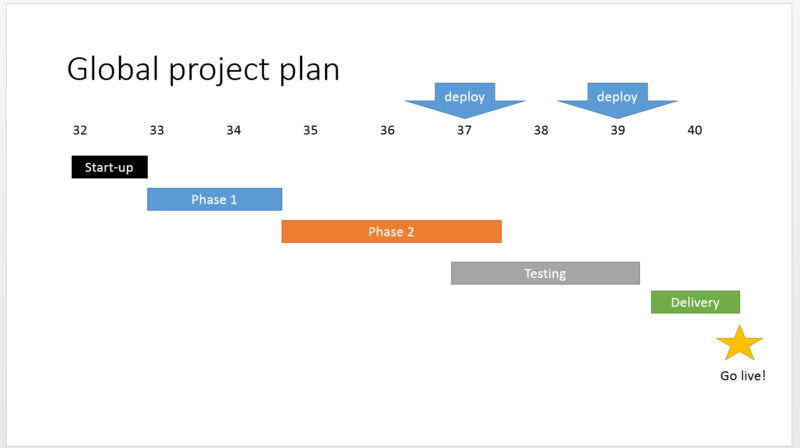 When the new project sites launched on Office 365, they came with this really cool Gantt chart that was fed from the task list! You can even manage it from Microsoft Project if you like! Awesome! We can now manage all of the project tasks and planning in SharePoint! Sweet! I’ve now tried three different projects using this task list with different people, different approaches, etc. I think it’s good for (very) simple projects, but it just takes so much time to keep updated with so little return. I think it’s going to go the way of the announcements webpart: great in theory but not used very much in practice. This is a nice looking solution. If you keep the number of the tasks simple, it can be a good tool for your project site. However, it’s another thing to keep updated beyond other project management tasks. This just isn’t shiny enough to take a screenshot of and share with a client – it’s really a working tool. Microsoft Project is an incredibly powerful tool. It is focused on project management, project planning, resource management and even portfolio management. Especially when Project server is involved, this is a force to be reckoned with. 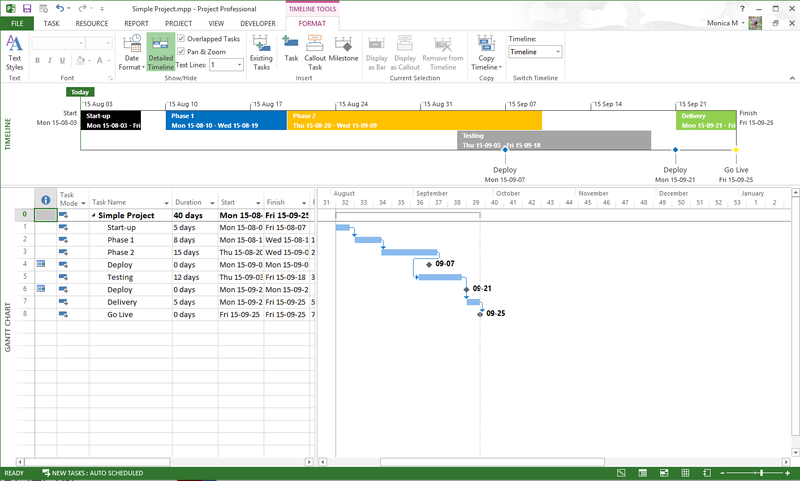 In the screenshot below, you can see the same project timeline example, but now set-up in Microsoft Project. 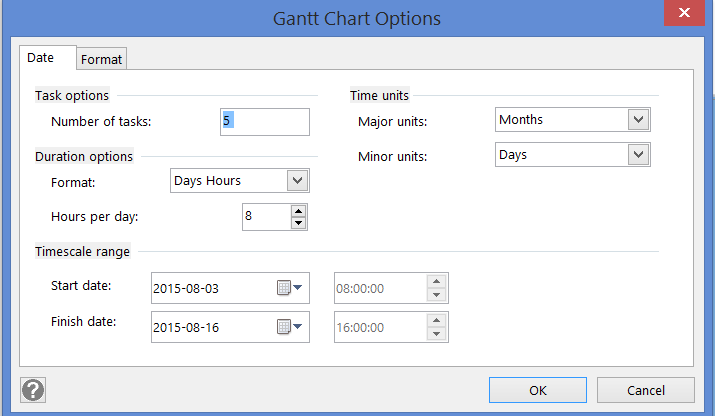 The Gantt chart is automatically generated based on the tasks and their information. The timeline at the top can be set by choosing to include tasks in it (similar to the SharePoint project site example). I didn’t actually even know this feature was available in Project! You can find more information on how to configure it here. While Project does a nice Gantt chart on the fly and the timeline looks somewhat shiny, I still can’t see putting this in a high-level client presentation. While Project is an excellent planning and project management tool, the displays are still too granular for presentation purposes in most cases. If you are using Project, you tend to have strong reasons for doing so – if you are using it, then this may be a possible solution for your presentation needs. If you aren’t using it, then the timeline feature is not a reason to start. Note also that Microsoft Project on a separate licensing model than the standard Microsoft Office. However, if you are using Project for project management, you have the benefit that all of the information is saved in one place and the charts would be automatically generated. Thanks to Monica Mortensen for her support with the screenshots and the deeper information regarding the timeline! When I was asking around for tips on approaches for creating these kinds of timelines, I was really surprised to get Visio as a suggestion! Thanks, @Wictor Wilen! You have a “Gantt chart” tab in the ribbon which allows access to useful tasks such as indenting/outdenting tasks as well as task linking. Clicking “Chart options” brings up the original dialog again. This is good stuff! You then work directly in the generated chart. The dates do not have a date picker (you need to manually fill in the date) which was pretty off-putting to me. On the other hand, you can fill in the start date and then number of dates; Visio will fill in the finish date. I was very surprised to note that you could drag and drop the bars in the Gantt chart and the dates would update! This works both for changing the date and making the task longer or shorter. I once heard that Visio is most like Excel than PowerPoint due to its information management possibilities. This Gantt chart gives excellent control over the data! However – no matter how I fiddled with it, I never managed to get the chart actually looking shiny and professional. Again – it’s a good working/collaboration tool, but not a great solution for presentations. I resisted trying this product for the longest time. It turned up a number of times during my searches, but it felt like the information I found was more promotion than personal preference. Once I tried it, I never went back to any of the other options. You can see that I’ve been consistent in setting the phase names to the left, with a dark blue color. Development is always teal and testing is always orange. These colors are also based on our corporate theme colors. You can’t see it, but this diagram actually has rows hidden – it also has information for each of the project member’s big summer vacation. I hid it because it was too much information for this context. Obviously, my own internal working documentation for the project is much more detailed, but this provides the client with such a clear overview of what is going on with the project. Each week, I copy/paste my weekly update PowerPoint presentation and simply modify the diagram as needed. When we replanned the project, it was not difficult to update this diagram, either. Office Timeline is a PowerPoint plugin which needs to be installed on your computer. Once it is installed, you will see the Office Timeline tab on the ribbon. Get started by clicking the “new” button, where you can choose your starting template. You can change this at any time on the fly later. Note that there are numbered vertical tabs to the left and right of the dialog: these are used for inputting the milestones and tasks as well as editing them later. The following screenshot shows the editing tasks screen. In this case, it has a date picker, it shows the week numbers (!) and you can choose the number if days if you like. If you have the plus version (as shown below), you can rearrange the tasks as well as change the task shape. My only complaint is that the date picker can be a little finicky and doesn’t always like to jump backwards/forwards multiple months. I spent about a month with the free version but did eventually go with the plus version. The screenshots have been taken with the plus version, which is why you may see extra functionality. Particularly being able to show the task percentage complete as well as rearranging the tasks are incredibly useful for ongoing projects. Bottom line: Go download the free version! You will not regret it. This is hands-down my favorite solution as it meets all of the original criteria. After eight months of Office Timeline, I wouldn’t want to use any of the other solutions. It’s good to have them in your toolbox as options, especially as they have many other uses. What do you use for customer presentations? We have a Gantt chart tailored for SharePoint on Office 365 that you install via simple drag and drop of 1 file (no need to bug the admin). It let’s you work with one or more task lists across one or more sites without all the clicking. Plus more, of course (multiple undos, basic scheduling, resource costing, etc…) that run on any device with a modern web browser.